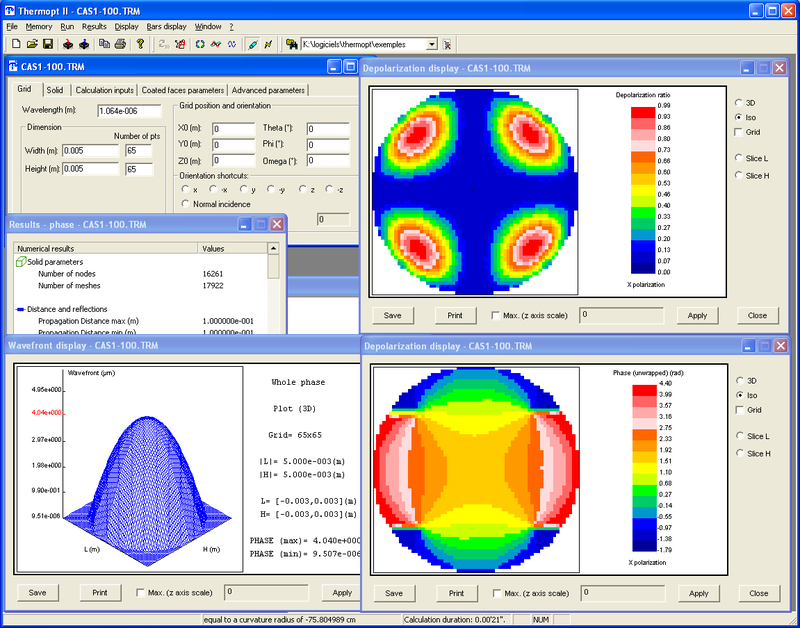 ThermOpt calculates the wavefront distortion and polarization changes of a beam propagating through heated active medium; this software is linked to I-DEAS, a software from SDRC (I-DEAS generates the temperature, strain and stress distribution of the active medium). The use of other software for thermal and mechanical calculations required a format conversion of the outputs file to be used in ThermOpt. ThermOpt also creates phase and birefringence masks. This masks can be read and used in Commod Pro. Commod Pro takes into account thermal lensing and depolarisation induced effects. Calculation of the wavefront distortion and polarization changes are performed using ray-tracing method. Depolarisation : transmission through crossed analyser/polarizer. Phase : local phase difference between the two directions of the beam polarisation. ThermOpt interface allows to display inputs parameters and 3D results of wavefront distortion for instance. Representation of mask of phase calculated by ThermOpt througth a cylinder and used in Commod Pro.